Edward Lawrence Keyes first recognized the usefulness of this surgical instrument in dermatology in 1887 (Hurkudli, 2015). After using the tool in a complex skin biopsy procedure, Keyes discovered the benefits and effectiveness of biopsy punches in the diagnosis and treatment of skin conditions. In “Novel Uses of Skin Biopsy Punches in Dermatosurgery”, doctors support the success of biopsy punches in dermatology procedures by stating “properly performed, it may confirm a diagnosis, remove cosmetically unacceptable lesions, and provide definitive treatment for a number of skin conditions” (Hurkudli, 2015). Skin conditions are treated sooner and more successfully when using the punch. Punches are an automatic instrument, and one of many tools available both as disposable and reusable versions. The procedure is very specific and precise which makes them so popular. Upon cleansing the targeted tissue and administering anesthetic to reduce discomfort, “the lines of least skin tension should be identified” on the area of targeted biopsy. Next, the physician stretches the target skin area perpendicular to the identified lines with their thumb and finger of the non-dominant hand. The physician holds the punch vertically over the area of tissue. As the physician rotates the punch downward, it penetrates both the dermis and the subcutaneous fat. Upon removal of the tissue the wound is sutured and a dressing is applied. (Zuber, 2002). Healing depends on several factors such as size of lesion, skin thickness, malignancies, melanoma or other skin disorders. The prestigious Mayo Clinic warns against any activity that may stretch the skin at the biopsy site. Healing time may take up to eight weeks. Minor scarring is inevitable for most biopsy procedures, and the “scar’s permanent color will be evident one or two years after the biopsy”. (“Skin Biopsy”, 2017). Results require a week or more to process in a laboratory depending on the skin condition and type of biopsy procedure. Most offices schedule a follow-up appointment if needed to discuss diagnosis and treatment. If no further treatment is required, a phone call to the patient conveys results privately. Skin biopsies are convenient procedures that require minimum interaction with the patient. They are a sound way to properly extract skin tissue for laboratory testing. The rise in use of biopsy punches for diagnostic procedures has yielded accurate and effective biopsy surgeries. While a punch may seem like a simple instrument, this tool has a powerful impact in the fields of dermatology and oncology. 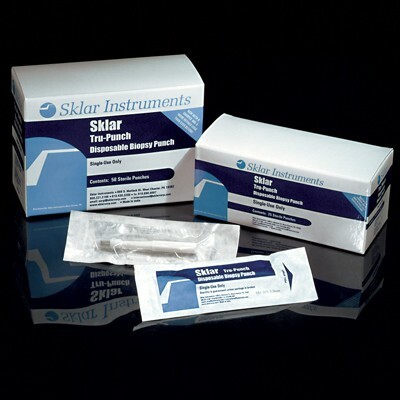 Sklar Surgical Instruments is proud to offer an extensive line of biopsy punches, including disposable punches. For details please visit our website here, or request a quote from a sales rep at 800-221-2166 or 610-430-3200. Hurkudli, Deepak S et al. “Novel Uses of Skin Biopsy Punches in Dermatosurgery.” Indian Journal of Dermatology 60.2 (2015): 170–175. PMC. Web. 21 Feb. 2018. Zuber, J. Thomas, M.D., Saginaw Cooperative Hospital, Saginaw, Michigan Am Fam Physician. “Punch Biopsy of the Skin.” 2002 Mar 15;65(6):1155-1158. Web. 13 Match 2018. Mayo Clinic. “Biopsy Punches”. 29 December 2017. Mayoclinic.org. Web. 19 March 2018.